I find the overlap of these theories interesting. There is already a thread here in CT about "targeted individuals" believing that the government is lasering them, even drying up their slobber while they sleep. And QAnon has a thread. And HAARP. So why not DEW-spawned wildfires? The claim, being taken up by an increasing number of people in QAnon circles, is that the fires are caused by “directed energy weapons”—that is, government-directed lasers bent on destroying homes, property, and lives. And if recent history is any judge, there’s a chance the country’s biggest conspiracy-peddlers, up to and including the one who lives in the White House, will take up the cause. Inevitably, the conspiracy theory is migrating to bigger and bigger accounts. On Thursday, a far-right internet personality and QAnon booster named Mike Tokes, who has 170,000 Twitter followers, aggressively took up the cause, using the same line of argument: some homes burned, others didn’t, thus lasers must be at work. Last edited by carlitos; 16th November 2018 at 12:02 PM. Problem is the first graphic is for our Red Flag alert, not where the fires are, nor their scope. Butte County had a similar fire in 2008 before the rail line was announced, and the state is just prone to fire anyway. You don't need a directed energy weapon, just a moron with a chain on his rear bumper hanging lose and causing sparks...or a Bic lighter. The "directed" part of the energy is necessary to explain why this or that building is burned out completely, while a tree or building nearby appears untouched. As usual, I get my serious news from memes. This kind of stuff is fun in a James Bond movie or Marvel/DC comics, but someone taking it seriously needs professional help, fast. Actually, that is a characteristic of crackpot conspiracy theories: They use ridiculous and highly improbably explanations when there are simpler, much more plausible explanations out there. But all the trees in that photo look very noticeably burnt. Are they saying these trees shouldn't be standing at all? paranoia tar pit first going anti-vax, then chemtrails and Truther, and now it's the cabal of Jewish bankers, and Trump, behind the fires. The most ironic horror of this is she's Jewish. Her friends are trying to pull her from the grasp of this hatefulness, but she's clinging to it. As I said in another thread, when people make of any baseless nonsense and lie into apart of their personal narrative, they are glued to it. So the whole crux of this conspiracy is that buildings burnt down when some surrounding trees are still standing. Isn't the answer here is that, depending on the construction, some buildings are more flammable than the surrounding forest and may catch fire when those trees don't? First, it's a drone photo. What condition are the trees in close up? Many are scorched and torched. Those kinds of trees have pine cones designed to open during a fire to drop seeds. If you look at Paradise on Google Maps' Street View you'll notice there is a lot of shrubbery missing. Simply put, these people are morons. Their writeup includes an overlay of the two maps from the OP. One of which is not the fire but just the red flag areas, as others in the thread have stated. The two maps don't line up. 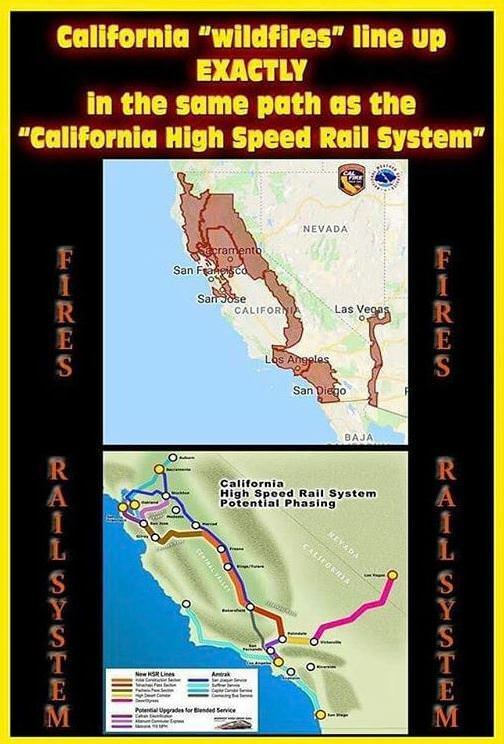 the high speed rail, for the most part, does not go through the red flag areas, much less the actual burn areas. Also, the OP has clearly never seen the results of an actual forest fire. Last edited by crescent; 16th November 2018 at 10:13 PM. 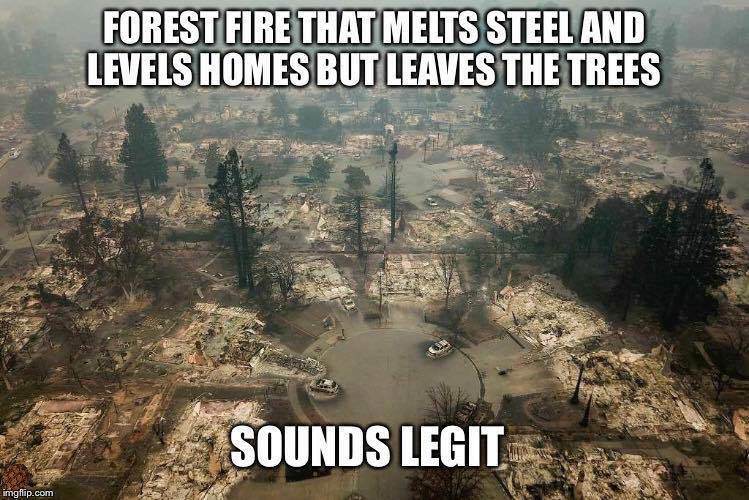 I never trust snopes but these fires are the result of bad forest management and environmental rules,Allowing brush and debris to pile up,the smokey the bear syndrome of putting out small wild fires before the undergrowth can be cleaned out by mother nature,etc..
P G and E will bare the brunt of the blame it seems but is it really their fault. Yes; apparently these didn't start as "forest fires" - that is, they didn't begin in forested areas, just wooded urban-interface areas. But how would a "laser" have that effect? I mean, I can see someone thinking that they used a laser to start a fire somewhere a fire would not normally start, but how exactly do they think a laser can guide a fire, such that it avoid certain trees? Once the fire starts, it pretty much propagates according to the rules of fire, without regard for how it was started. That's actually one of the big problems with using fire as a weapon: once you start it, you no longer control it. There's a similar thread on ATS claiming that the fires are caused by microwave radiation from energy harvesting satellites in orbit. The evidence is that, erm, there are patents and yeah boo Big Energy. The fact that there are no such satellites is a minor inconvenience. As for the trees, some conifers (eg larch) contain a natural fire retardant and are used as fire breaks in forestry plantations. The beauty of Snopes is that you NEVER need to trust them. They provide all info and all sources to their conclusions. You don't trust them? Easy to look at the maps, the same ones that were provided in the OP. The Camp fire started in a burn scar that had been logged both before and after the fire, which was about a decade ago. Then it burned through a bunch of logged areas before hitting the town. This Facebook post shows the burned area, it was put together by a man that does GIS to support wildland fire management. The area where the #campfire started has some of the most severe fire weather on the West Coast. All of the area burned in the initial push of this fire out of the Feather River Canyon and across Concow burned hot in 2008. Just ten years of regrowth, along with the left over dead material from the 2008 fire, were enough to drive this catastrophic fire. Except for the industrial timberlands in the fire area, just about everything else is brush and small private parcels, there is almost no public forest land anywhere in the entire 100,000 acre+ burn area. I dearly love how America has all these secret weapons that can start fires and create Earthquakes and create Holographic planes to fly into buildings which are then destroyed by super thermite and magic dust making foam and control the weather and do mind control and we never use them in wars, just to %$#@! around with our own citizens. "General should we use our secret army of Ninja Cloned Cloaking Velociraptors/Gorilla Hybrids against ISIS?" "Hell no. Let's use them against Des Moines." The venn diagram of people that believe this and truthers has t be a perfect circle, right? That is an excellent write up. I'm going to shut a few morons up with it. P.S. I love snopes and am often posting links to them as comments on Facebook when someone posts some crap. And it might have to do with high-speed rail. For the benefit of those unfamiliar with the source, it is polite to give proper attribution when quoting the president. Yes, the young feller in the striped shirt is young Gene Roddenberry, producer of STAR TREK. Based on personal experience, it's actually quite common for wildfires to leave patches of unburned vegetation in the middle of heavily burned areas. If that is evidence the use of lasers or something like that, you pretty much have to believe that all wildfires are fake. Of course, that's probably not too much of a reach for most conspiracy theorists. Directed Energy weapons are used on people too. Aim at the one second from the left! ...no, no the OTHER one second from the left. Your OTHER left. Idiot. No Offense, but this poster isn’t here to make a point. Directed kinetic energy weapons have been used on people for as long as there have been people. Arguably, directed kinetic energy weapons define people. A recycled or reincarnated pigeon, perhaps. No Offense intended to any pigeons that might be reading this. Well my parrot squawked when he read that.